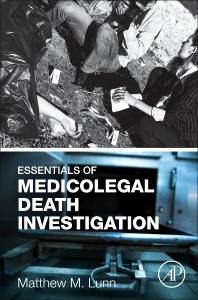 Essentials of Medicolegal Death Investigation uses a unique approach by combining medical issues, injury patterns, and investigative procedures to provide the reader with the basic fundamentals for a death investigation. The text introduces the reader to death investigation, common causes of death, and very specific types of death, including blunt-force injuries, gunshot wounds, and toxicology deaths. Each section includes case studies with written and visual descriptions. Written by a well-known and experienced medicolegal death investigator, the book fills a void in medicolegal literature for both students and professionals alike. Matthew Lunn, MS, F-ABMDI, is a medical investigator and criminologist in the Denver metro area with extensive experience in the investigation of violent and high profile deaths having been an invited speaker at local, state and national trainings. In service to the profession, Mr. Lunn is the current Vice President for the American Board of Medicolegal Death Investigators (ABMDI), a Director for the Forensic Specialties Accreditation Board (FSAB), is active on multiple committees for the National Association of Medical Examiners (NAME) and is appointed to multiple federal initiatives related to medicolegal death investigation. Mr. Lunn did his undergraduate studies at Iowa State University, earned his Master of Science at Regis University, and is completing his PhD at the University of Colorado, Colorado Springs.